About 12 miles to the northeast of York, there is Castle Howard, one of the most magnificent country houses in England. The house was built by Charles Howard, 3rd Earl of Carlisle in the design of John Vanbrugh, a remarkable architect of the Baroque style. The Earl of Carlisle was related to the family of the Duke of Norfolk, the most prestigious peer in Britain. The building of the house began in 1700 and about two thirds of it was completed by 1714. But in the 1720s the construction went slowly because of shortage of funds and Vanbrugh's death in 1726. 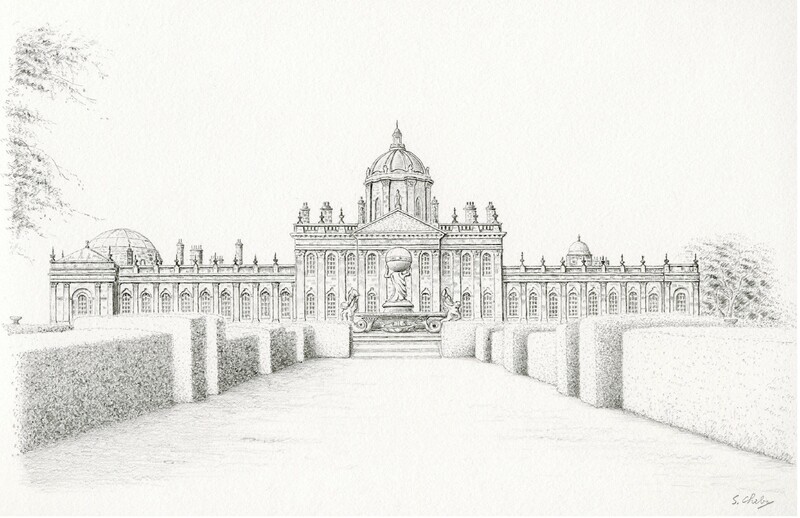 After Vanbrugh's death, his assistant architect Nicholas Hawksmoor continued the work little by little. The successive deaths of Harksmoor in 1736 and the 3rd Earl in 1738 halted the work, leaving the West Wing untouched. In 1759 Henry Howard, 4th Earl, completed the work of the Palladian West Wing, which was designed by Sir Thomas Robinson, the 4th Earl's brother-in-law and a Palladian architect. The building of the house was then finished. Castle Howard is not just a country house, but a palace. I was surprised at the gigantic lantern tower having a dome, when I saw the house for the first time. The solemn and magnificent house reminded me of St Peter's cathedral, Vitican. Vanbrugh designed this grand house in 1699 and also designed Blenheim Palace in 1704, then later he was knighted. He was not a professional architect but had a very skillful assistant architect Nicholas Harksmoor. It is said that Vanbrugh could not have completed the houses without Harksmoor's assistance. Vanbrugh was very talented person and had various backgrounds such as the captain of the Royal Marines, a painter, a playwright and an architect. He knew how to get along in the world and seemed to be a questionable man for me. Yet his achivement was great indeed. I prefer Castle Howard to Blenheim Palace. The former is dignified, romantic and fantasic while the latter has a lack of elegance, being "wild and unmerciful" as Sarah, Duchess of Marlborough said. Having many fine pictures, Castle Howard is comparable to an art museum with masterpieces of Italian Renaissance, Hans Holbein the Younger, Rubens, Van Dyck, Thomas Gainsborough and Joshua Reynolds in the long gallery of the west wing. I only knew the portraits of Henry VIII and Thomas Howard, 3rd Duke of Norfork painted by Holbein from art books. Holbein painted several portraits of the King. The most famous one (Barberini collection, Rome) painted in 1539/40 shows him powerful and energetic. But in his portrait of Castle Howard, painted in 1542, he looks in low spirits. Holbein did not miss the decline of the King's health. 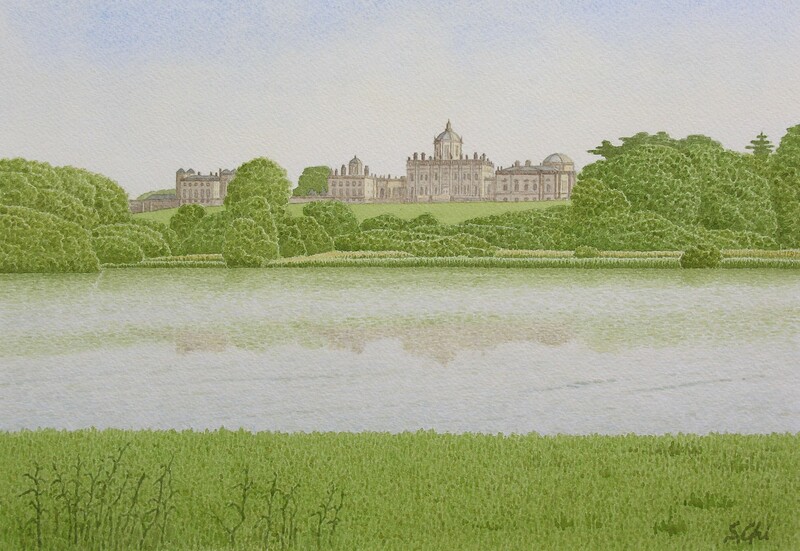 The view of Castle Howard seen over the South Lake and the Great Lake were very picturesque. When I watched the cinema "Barry Lyndon" directed by Stanley Kubrick, I noticed the view of the house appeared in it many times as Castle Hackton, the house of the Countess Lyndon.